You can access a screen reader accessible version of this document here. 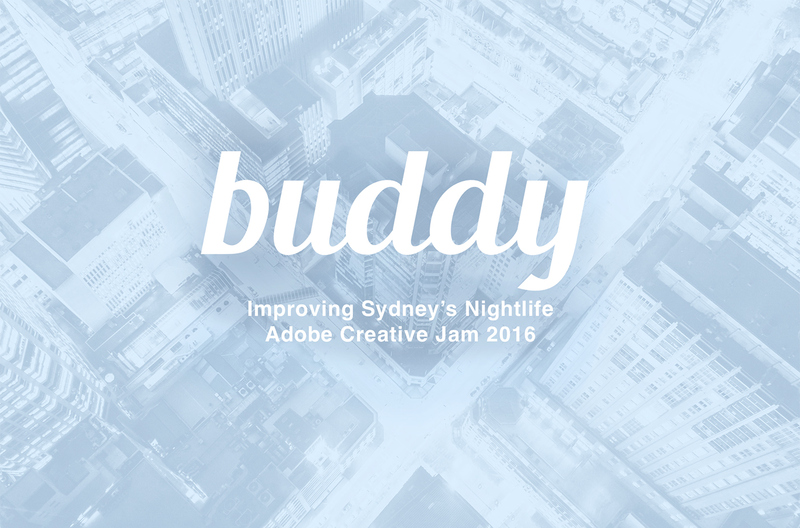 'Buddy' was the winning app concept in Adobe's Sydney #creativejam 2016, a little competition where design duos compete against each other to create meaningful and helpful experiences for people and pitch them to a panel of other designers. We were told we had to reinvent Sydney's nightlife with only 3 hours and Adobe Creative Suite, and no other rules. We created 'Buddy', where people meet other people to get to places safely at night and this is how we did it. Together we had discussed our own experiences in navigating through and participating in Sydney's nightlife. Two different personas could almost be made by the different lifestyles we lead; Monica - the typical gig-goer, who is often travelling alone between venues in the ungodly hours of the morning, and Rehab - the lovely aunt who enjoys taking her nieces to night festivals in the city as much as she likes exploring the city alone. Mapping out each other's journeys, we attempted to extract different needs and pain points, and the one common one was safety. Both of us had experienced moments where we felt threatened by people and our environment. There's lots of uncertainty when trying to get about at night, and we are not the only people who feel this way. We briefly talked to our friend Tommy Dinh about his nightlife experiences as an Asian male in Sydney. He shared with us a story of him witnessing racial abuse on public transport and how unsettled he felt. This lead us to researching about similar experiences people faced in public, where we discovered multiple occasions of racist attacks on public transport. It is widely recognised that safety is a basic human need and right, and many attempts have been made to make people feel safer in a variety of contexts. Following the Sydney siege in 2014, much of Australia's Muslim population felt threatened by the increased and widespread Anti-Islamic sentiment going around. The #illridewithyou movement spread throughout the country, through which people offered and sought safety by traveling together. We thought it would be useful to take this idea and make it universal and tangible. We also drew inspiration from other contexts. Apps have been made to help you escape awkward and threatening dates, or check in with your family and friends. Just recently (and very controversially), Uber has extended its service to track users after a trip has ended, as an effort to protect them. These are just some examples of interfaces and services we looked at. Difficulty often arises when you start envisioning what an experience might look like, and it's really easy to lose track of what you're trying to help people do in different situations. So we wrote down different usage scenarios to ensure that we were sticking to a human-centred approach to design, with the users being first priority. These scenarios would also help us in the final pitch, as they got the audience to empathise. Maybe you're leaving a warehouse party at 4am. You've had a really good time but now you have a long, lonely, and eerie and... kinda boring trip home. Maybe you're a massive foodie and you're leaving the Night Noodle Festival but there are lots of scary, drunk people around from a weird gig nearby. You're trying to power walk but... you're too bloated from all the noodles you just ate. Maybe you're a creative professional trying to get to the Creative Jam tonight. You've never been to the venue before but it's peak hour, and that's a $30 Uber ride for a 3km distance. Maybe you could just walk... with a buddy! Under time constraints, we had to think of the best way to create and communicate the concept well. We knew what the pain points were, and all we had to do was present a tangible service and UI design. We did this by presenting a relatable user story, which also determined the screens we had to make in the small amount of time that we had. Adobe XD was used for this as well as pen and paper for cheap, quick iterations and brainstorming. Adobe XD was particularly easy to use as there were Material Design templates available to us. Creating links within the prototype was also not difficult or time consuming to do. This was the final prototype, with the interactive version of it available here (limited functionality). 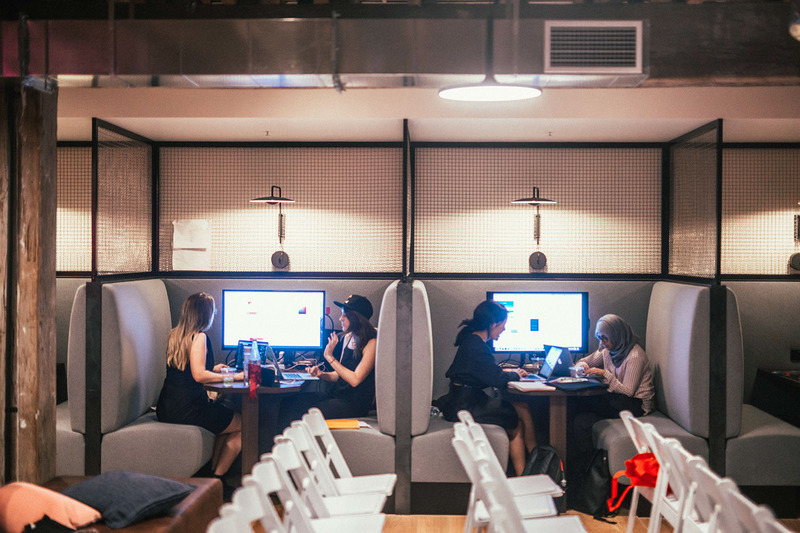 We would love to consider conducting more exploratory research to understand the problem space fully and ensure that the concept is based on robust user insights that we have found from research. Testing the app in different scenarios would also be awesome to help inform future design decisions, and to find the gaps in our product.